One may think that the development of computer processors has slowed down in the past few months with AMD stating it will keep on releasing FX Vishera chips for the next year, while Intel has delayed the arrival of its desktop Broadwell processors. In fact there’s some serious development on the server CPU market and it will be felt soon with Intel releasing ultra powerful 18-core Broadwell chips. According to new Intel slides the company’s roadmap includes the arrival of powerful new Intel Xeon processors on the Haswell and Broadwell architectures. The US chip giant will release the Xeon E5-2600 v3 “Haswell-EP” processor with up to 14 cores in H2 2014 and the Xeon E5-2600 v4 “Broadwell-EP” processor with up to 18 cores will follow in H2 2015. Both processors will have a lot in common – they will support quad-channeled DDR4 memory, 40 PCI-E 3.0 lanes and two QPI 1.1 buses. The Broadwell processor will also come with a better memory controller that will support DDR4-2400 memory and 3DS LRDIMMs. 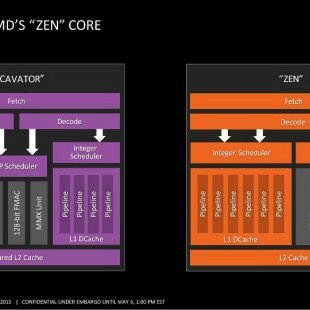 These improvements along with the architectural ones will allow the upcoming Xeon E5 processors to run 25-80 per cent faster than existing Xeon E5 “Ivy Bridge-EP” chips. Another good news is that they will run on the Intel C610 chipset, which means that owners of these processors may not have to change motherboards when they want to upgrade.